Since getting back into comics I have been finding that the Wildstorm universe is probably one of the best put together universes in comics. And the foundation of the Wildstorm Universe is all based around Team 7. All the major characters have spawned from Team 7. Whether it’s Grifter who was a member of Team 7 or the entire team of Gen 13 who are all descendants of Team 7. With that said my review this time around is the deluxe hardcover of another member of Team 7. Deathblow is one of real standout characters of the Wildstorm universe, but he hasn’t really had the exposure that other members like Grifter have seen. 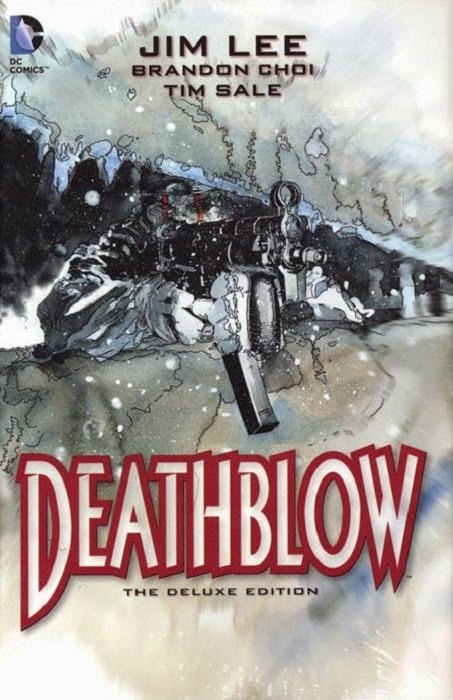 Deathblow was the only member that survived that didn’t get affected by the gen-factor testing. But since the break-up of Team 7 Michael Cray/Deathblow has continued working for I.O. as a mercenary. And the years of killing are catching up with him. Mentally, spiritually and physically. The story starts with Deathblow finding out that he has terminal brain cancer and only has two years left, so he decides to take care of unfinished business from his past. Unfortunately his actions put him at odds with his former employers. Which leads to him being forced to kill a man he trained. And that is when his descent begins to settle in. But that just sets the table for the true story in this series. Michael finds out that the cancer has spread throughout his body and now he only has a couple months left to get his affairs in order just before going on one last mission. The mission takes him and his team to Iraq to take down a Hussein-esque dictator. But there are darker powers at work, and their mission leads to the release of “The Dark Angel”. The second in command to Lucifer and the only person who can release Lucifer from his prison. In the battle Deathblow kills a priest that was part of The Order of the Cross, a faction of the Vatican specializing in battling the servants of the dark lord. Putting Cray right in the middle of a battle that’s been waged since the death of Christ. All of these events align with the rise of a child that is prophesied to put an end to the dark of the world. A former cop turned nun named Sister Mary takes the child into hiding on the orders of the Order of the Cross. And eventually Deathblow and Sister Mary cross paths and team to try to stop the darkness that is gaining power. But both sides are trying to recruit Deathblow for their cause. The Dark Angel wants him to lead their armies against into the Heaven and help them burn it out of the sky. Where the Order of the Cross wants to help him atone for what his life has wrought, and in turn use their weapon against them. And both sides are devious with their methods to try to convince him to join their cause. The Order promises him he can drink from the Grail, which would heal him of his cancer. Art wise Jim Lee only does the first issue of the series, and this is some of his best nineties art. But the book gains so much more when Tim Sale steps in. Sale brings his usual rough line work, but it never feels as exaggerated as the art he is really known for. Sale really shines with the subject matter of the book. If there were any downsides to his art, it would be that there are a couple female characters within the book that look almost identical which makes hard to tell at first if they are supposed to be the same person going by different names at first. I would be doing a disservice if I didn’t mention that the packaging on this collection is great. It is a nice sturdy hardcover and it has all of the Pin-ups and variant covers in the back. And the pages are a high quality paper. I highly recommend this series to anyone who likes great character writing and beautiful art. As well as anyone who wants to see why the core of the Wildstorm universe is one of the strongest in comics. Thanks for reading my review. If you have any comments or questions, leave them in the comments section. And as always, Keep reading comic fans.